Small Fysh in a big pond: Taking a Lync Polcom CX600 home to meet the family. Taking a Lync Polcom CX600 home to meet the family. When demoing Lync to teams within Freebridge one of the hardest concepts to get across is that a phone number is now not tied to a bit of plastic that sits on your desk but it is now part of your user account (the same as your email). Some people thought still like the idea of having a traditional looking handset to pick up. For these people we supply either the Polycom CX600 or the Plantronics P540. Once our end users have the freedom to login from anywhere (home, coffee shop, train) then they start asking can they use their handsets there too. The P540 is a dumb USB device so just taking it home with you and plugging into an internet connected and Lync cliented PC means that “it just works.” The CX600 is a different beast. 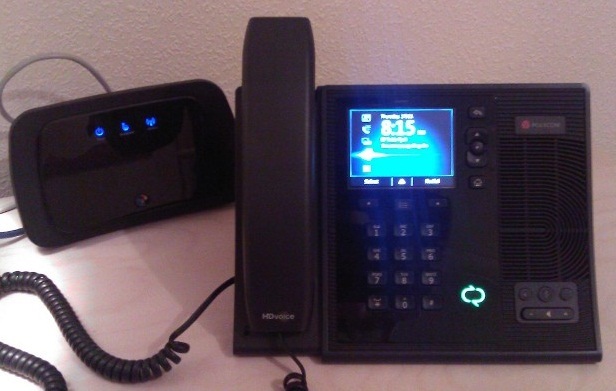 It’s an IP phone using Power Over Ethernet (POE) that when on the corporate network finds our front end pool and allows you to login fully on the phone. When at home then you have a few barriers to overcome to get the CX600 to login. The phone needs to know how to connect to the Edge Server. For a new out of the box phone we have an issue though. The sign in on the phone is your extension and passcode. The phone has no knowledge of what that extension number connects to and as such will fail to find the Edge server. The solution is to plug the USB cable into a computer that has Lync on it and then us the “better together” feature to pass the network credentials from the Lync client on the computer to the phone which will then be provisioned to find the Edge server and log in successfully in future.